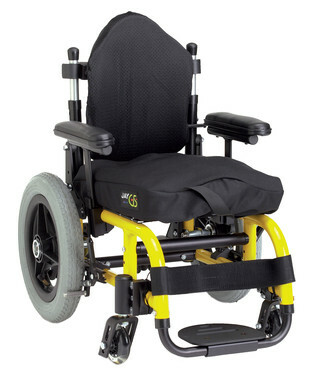 The Zippie® Kidz is the smallest pediatric rigid wheelchair from Zippie. Available in standard or reverse wheel configurations, the Kidz is ideal for growing toddlers who are learning to navigate their world through mobility! When your child grows, be at ease knowing the Kidz chair will be ready! With a depth-adjustable back that allows the seat depth of the wheelchair to grow as much as 3", the Kidz will grow with your child. Additional depth and width growth may be achieved by replacing parts. Self-propulsion allows children to explore and interact with their environment! The Kidz was designed to give toddlers maximum independence by providing them access to the wheels. When your child is learning to propel, the push wheels can be placed in reverse configuration at the front of the frame for best access. As their reach grows, the wheels may be moved to the rear of the frame. Interaction with peers is essential to children's development. The Kidz chair is available with seat heights as low as 10 3/4". This allows your child to interact with peers at eye level and easily travel between the wheelchair and the floor during playtime. Chair Weight (Without Footrests if applicable) 14 lbs. Overall Chair Width 18" to 22"
Front Seat-to-Floor Height 1.75" to 14"
Rear Seat-to-Floor Height 9.75" to 14.25"
Back Height Regular: 8" to 10"
Center of Gravity (COG) Adjustment 0"